At SayulitaLife, we believe that ads should contribute to and be consistent with the overall user experience. The best ads are those that are tailored to individuals based on search criteria, clear text, and pertinent photos. These guidelines are not intended to serve as legal advice and do not necessarily constitute legal compliance. Advertisers are responsible for ensuring that their ads comply with all applicable laws, statutes, and regulations. You acknowledge and agree that Sayulitalife.com reserves the right to change, modify, alter, update or discontinue the terms, conditions and notices under which Sayulitalife.com is offered and the services, features, links, content, information, all client information and any other materials offered via Sayulitalife.com at any time and from time to time without notice or further obligation to you. By continuing to access or use Sayulitalife.com after Sayulitalife.com makes any such modifications, alterations or updates, you agree to be bound by such modifications, alterations or updates. on SayulitaLife (including ads purchased and content placed without fee). C. Ads must not contain false, misleading, fraudulent, or deceptive claims or content. may not change the advertiser or client associated with an established ad account. and effectiveness of your SayulitaLife advertising campaigns. example, transfer data to a third party who then transfers the data to an ad network. regulations and guidelines. All claims in ads must be adequately substantiated. SayulitaLife's targeting guidelines and applicable local laws. determine whether particular content is in violation of our community standards. We respect clients’ desires to showcase an external website and therefore offer the following policy. Sayulitalife.com strives to give a balanced and fair user experience, and external links distract from that experience. Sayulitalife.com prides itself on quality of design and effectiveness of our website. Sayulitalife.com is a cross-platform display of all businesses and keeping users on the site allows for each home and business to be viewed fairly. Sayulitalife.com is not a link farm but does allow every advertiser to place one URL in the designated URL field, not in the general text or images. These links will not be active. If you want your link to be active, contact us. Links to relevant information assist websites with Google placement and thus will benefit both of our websites. We highly encourage reciprocating links with our website with consent from Sayulitalife.com. If approved, SayulitaLife advertisers are only allowed ONE active external link. URLs placed on advertiser pages that do not adhere to these reciprocal link regulations are subject to immediate removal without any notification to advertiser. 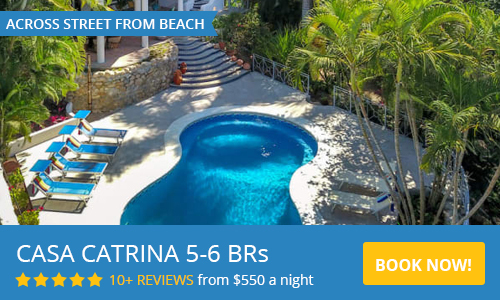 Please note our reciprocal link offer is not valid for websites containing multiple Sayulita rental houses, real estate companies, or vacation rental/management companies. including copyright, trademark, patent or any other proprietary right.